Mawlana Hazar Imam was recently interviewed by Henri Weill, Editor-in-Chief of the French magazine La Cohorte on the occasion of his receiving the Grand-Croix of the Légion d’honneur in September last year. The interview touches on key points including the role of the Imam, the importance of civil society and the necessity of creating strong institutions that can contribute to positive growth. We are pleased to make this interview available in both French and English with the kind permission of La Cohorte. Your Highness, you are a head of state, but a head of state without a State. In fact, I am the Imam of an international community. As you know, there is no state that is totally Ismaili. The community is in South Asia, Central Asia, the Middle East, in Africa, and now in Europe, North America and Australia. A part of it was in the former Soviet Union, because there is a large community in Tajikistan. It has become internationalised since my grandfather died in 1957. But how should we consider you internationally? As a Head of State? A prince? An Imam? What is the community for which you are the 49th Imam? It is a Shia Muslim community which has been in existence for centuries with successive Imams and is probably now more international than ever. I think that is the major difference with the past. We have created institutions in countries, especially in the West in which we previously had no presence. We have universities, schools, financial institutions in a very large number of countries that serve both the community and the local population. 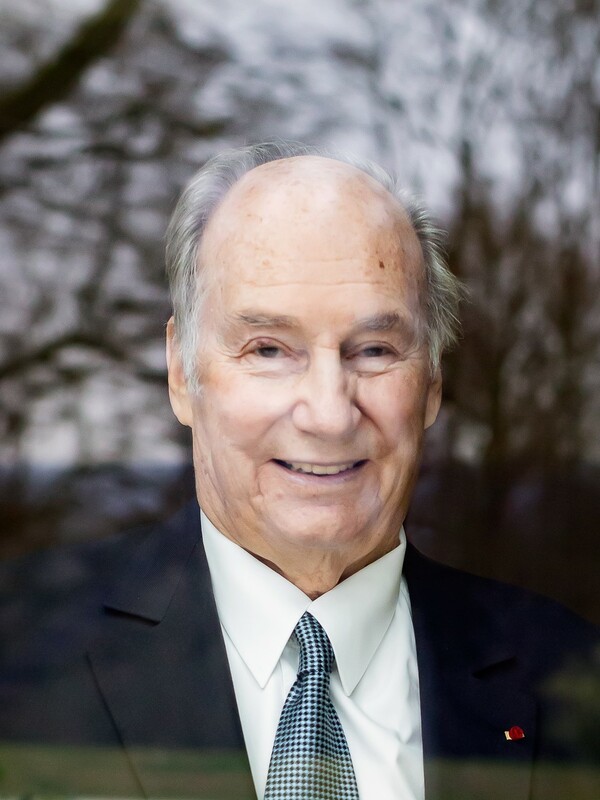 "I want my institutions to look to the future," Mawlana Hazar Imam. What is your goal? To reduce poverty? It is to improve the quality of life and that indeed involves reducing poverty, but it also provides people with the means to improve their quality of life. That is the goal. For example, we try to eliminate disease when we can eliminate it, we want to build national or international institutions, such as universities, schools and hospitals which help the community and societies. It is therefore necessary for the community to be valued, recognised and its institutions must serve the countries in which they are based. But isn’t it rather unusual for a spiritual leader to be involved in development? Not in Islam. This is one of the major differences between Islam and many other religions. Here, the Imam is responsible for the quality of life of the men and women who look up to him. He gets involved in their daily life. But there are many Islams. Are you representing the social side? In Shia Islam, Imams have always been concerned with the community’s quality of life. In Sunni Islam, it is much more dispersed since there are many more Imams. But are you not in fact, looking to show the religion in another light? I think it is more a question of interpreting what you mean by religion. The 48th Imam had his own views and an enormous political career. Personally, I was not interested in a political career, but I have one through the community. It represents a large population in countries where there is a political life. And that is why we have set up national councils in twenty countries, made up of volunteers committed to improving quality of life. Do you also want to project a very ethical image? Yes. I think that having a community that is committed to ethics, is very important and particularly in democratic countries. You just mentioned your predecessor (your grandfather). You are the 49th imam. And have been for over 60 years, now. What have you learned from these six decades? There are certainly some things that stand out. In 1957, the Cold War was a major problem for Western governments, and the world in general. That Cold War had a significant impact on the Third World. The Cold War no longer exists. It has been replaced by other visions of what a State is, so now the core issue is one of good governance. When we look at the world we are not moving towards this type of governance, on the contrary, it seems to me we are regressing? I think it is a fluctuating, unstable situation. That is what makes planning quite difficult. The former Soviet countries came out of the orbit of the Soviet bloc, other countries, which had been colonised, decolonised themselves and became independent. Then there was a whole series of regional agreements that have played their role. Financial institutions have become very important and have an impact on Third World economies in particular. We are living in a totally different world. And the most important thing is to be able to predict change such that a community’s institutions can start anticipating and preparing themselves. And it's a very complex job, but it's fascinating and if it's well managed will produce excellent results. Do you never have moments when you feel disillusioned? Certainly, and moments when I am worried, because often disillusionment follows on from worrying. Firstly, we are concerned, then we start to feel forces that are not necessarily those we want and we try to anticipate. A big debate, which existed as far back as the 1960s and still goes on today is the role of the State in the life of its people. 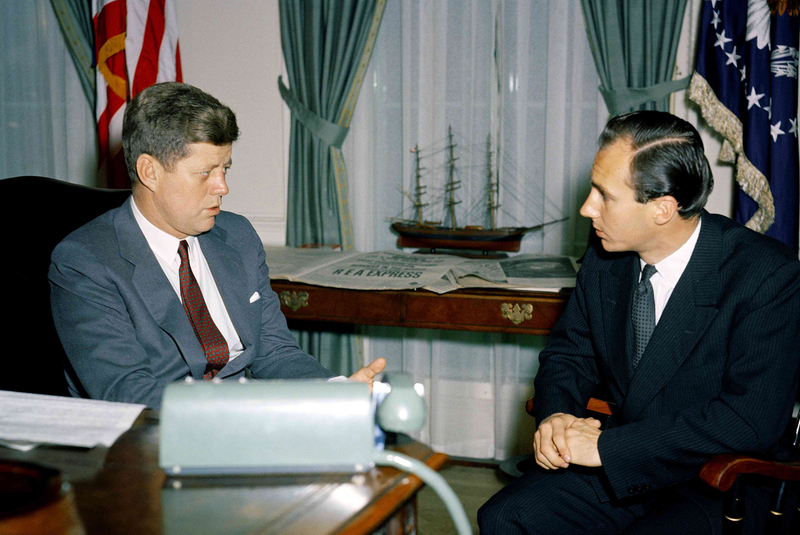 Meeting with President Kennedy in the Oval Office at the White House in 1961. Through your foundation, are you replacing the unsatisfactory roles of certain states? We are indeed trying to get involved wherever we can play a positive role, and not just for Ismailis. We often have partners who work with us and even international partners such as the World Bank and other similar institutions. Is that why you became a partner of the Peace Forum? Yes, it is one of the things I have done. Peace is clearly something that we are trying to stabilise, and above all to strengthen. It's very complicated. However, it is very important to make dialogue a part of everyday political life. We're getting there, but it's slow. When you look at the Third World, where the Ismaili community is particularly present, we have to ask ourselves about governments. And I have always taken the view that civil society must play a fundamental role in the future of all populations. So, we have to consolidate and strengthen it. And that means taking the most important institutions of civil society and giving them support and encouragement wherever we can perhaps help them do things differently from anything we have known up till now. Especially when it comes to decolonisation. Do you want to embody a voice of reason? Oh, I'm not sure that's the case, but I hope it's a voice of logic. The Imam's role is also to anticipate change, to help make positive changes. In the end, it is the strength and quality of civil society that determines people’s quality of life. It seems that your message of peace, forged from logic and reason is one that is heard with decreasing regularity today. Yes, that's right, but I think it's also because of the problems with governance and economic imbalances. Foreign influences also have a big role to play. We are faced with a world that is changing and trying to develop. I am optimistic yet cautious. Do you only work in those countries who ask you to get involved or is it you who makes the request? We work in countries where there is a community or in countries that ask us to get involved, even if there is no community. We have realised that regional phenomena are very important. Even if we are not present in a given country, if a neighbouring country has a large community, you try to build with that State. Do you consider yourself a benefactor of humanity? Not a benefactor. Benefactor means that we are involved in philanthropy; I work within the framework of the institution of the Imamat. We certainly do philanthropy of course, but we also set up economic institutions, which have their own business life and are intended to last and grow. In sixty years, you have built so much. Yes, I have built things because circumstances demanded that I do so and that it was what the community needed; but this process of growth is an infinite process at the same time. So, what is important is to try and predict future developments in society and then create institutions that can contribute to positive growth. For example, it is important to reduce poverty as much as possible. 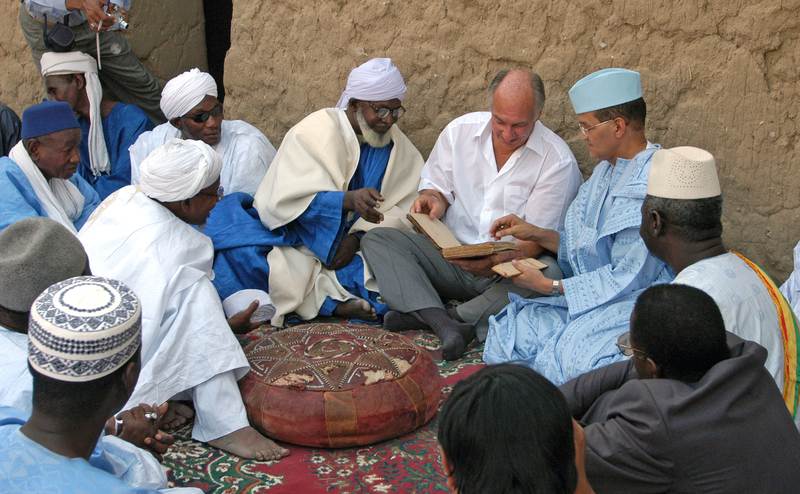 The Aga Khan surrounded by the Prime Minister of Mali and the Imam of the Djingareyber Mosque of Timbuktu (Mali) in 2003. The conservation work of this 14th century UNESCO World Heritage monument was financed by the Aga Khan Trust for Culture. That is an uphill battle. It is probably a battle that is limitless in time. We try one direction. We don't necessarily know what will happen, but we know we are on the path. For example, in health or micro loans, we can measure progress in improving quality of life. Do foreign heads of state often ask for your advice? Yes, that is true. Especially in countries where there is a large Ismaili community or strong institutions. And it also works the other way. I talk to them because I need to know what their thoughts are on the future, what is the best academic or economic institution. But by investing, you're not looking to proselytise? No, we do not proselytise. We could, but we don't feel the need. There are certain religions where proselytising is recommended. We however, take the attitude that everyone should do whatever they want. If they want to become a Shia, they can become a Shia, if they want to become a Shia Ismaili, they can become a Shia Ismaili. What is the next major project that is really dear to your heart? I believe that the civil society today is very influenced by large institutions, when they have been well founded, are stable and extend their influence to civil society. And this is what I am trying to support the Third World. For example, in education, we have universities in Central Asia, Pakistan and East Africa. They have an enormous influence. We are trying to create strong institutions to support society. Not only with universities but also with hospitals, banks, financial companies, etc. No, but I have had to learn what that is. We have our own institutions which are not at all limited to the Ismaili community. We start with microfinance and go as far as financing the largest companies. We are trying to support economic development. There are countries that have emerged out of poverty and wherever we find ourselves, we must contribute to this development and ensure that it is positive and stable. And these two things don't necessarily go together. Development programmes that include improving housing, for example. I will tell you why. When we studied the economic development of poor societies, we realised that when poor families manage to put money aside for the first time, they invest in their homes. Often it is a tin roof, running water or a sewerage system. In other words, human beings first look at everything that happens around them and their family. By working on people’s homes, we are working on basic needs and this then has an impact on several generations in the family. It is often an asset which increases in value if the property is well managed. So, housing has an impact on many areas in a family's life and that's why I wanted to monitor the development and try to support institutions that help to drive change. 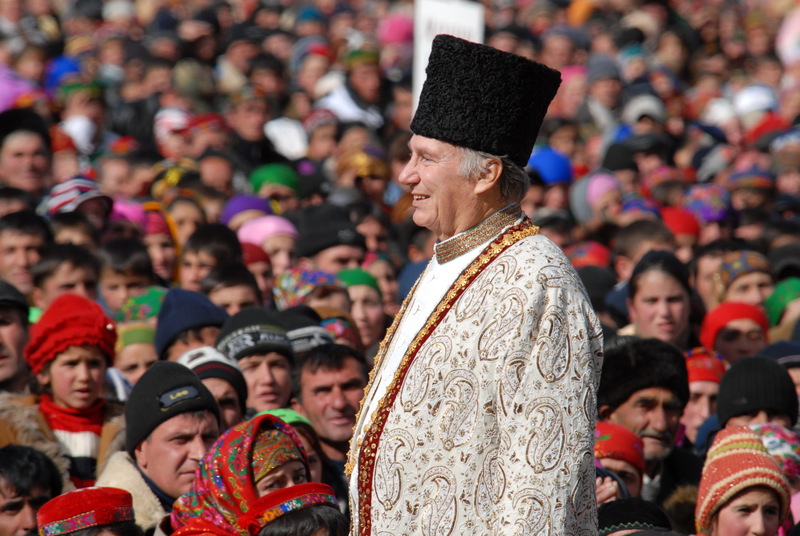 In Tajikistan, several thousand members of the Jamat came together for Mawlana Hazar Imam's visit. Culture is also a priority. You support architects as much as music. Even to the point of creating awards? I am interested in music because we are trying to broaden the international reach of Third World cultures. If we can make them known and appreciated in the West, we can bring them stability as well as knowledge about the cultures in these countries. And often there are connections that are extraordinary, especially, for example, in ‘devotional’ music. For example, the music of Central Asia. Would you make a perfect head of state? But that desire is still with you. I was educated in a country where development is seen as a phenomenon of world life and so I observe as much as possible, I try to ensure that our institutions look to the future. Because in the end, anticipating is necessary in life, whether you are dirt poor or fabulously rich. You need to be able to anticipate intelligently. Anticipate and think about others? Are human beings at the centre of everything? Clearly. And then, I have a conviction: poverty exists, but is not inevitable. We need the courage to analyse and understand it. A few years ago, we analysed Ismaili demographics and realised that the environment was the biggest contributor to poverty in poor communities. Some communities are born and live in a place in our world where the local economy cannot support human life. So, when we came to this conclusion, we recommended these communities to move and settle elsewhere. There are places on our planet where human life is unsustainable and if there are communities that, for historical reasons, live there, you know that there is no future for them. This is not subjective, it is an economic fact. We are duty bound to tell the people this, and then we try to develop the resources to help them move. There are countries where 50 years ago our community lived in really very difficult conditions and we told them, “Listen, take your time, it may not be possible for today's generation but perhaps for tomorrow's generation, but educate yourself, prepare yourself to go and settle elsewhere”. It that a painful process? Yes, and it is always difficult to move communities. It is a decision that you take unwillingly. The circumstances make it necessary. If the measurable evidence shows you that quality of life is impossible, you are obliged to draw such conclusions. So then, you prepare the younger generation with education, in other words with languages and technical knowledge. In this case, we are not being subjective, we must be rigorous and even quite hard sometimes. Because communities do not move alone. We have to prepare the place they will move to, create institutions, schools, financial institutions, etc. That is what we did in Tajikistan for example. Your Highness, are you considered to be a good man? That is the role of the Imam, but not only mine. I think that is the right vision for an Imam. Why did you choose Portugal as the headquarters of your Imamat? The Imamat is an institution that is originally from the East. And I wanted it to have a head office in a Western country that would recognise the Imamat as a religious institution. Portugal is a country that has signed the Concordat with Rome and therefore there was a precedent that allowed me to sign a Concordat with a Western state that was somewhat similar. Yet, you are deeply French, or at least you are a Francophile? Yes… Many of my studies were in French and I live in France. We have extremely cordial relations with the State but there is not a Concordat such as we could have with Portugal. 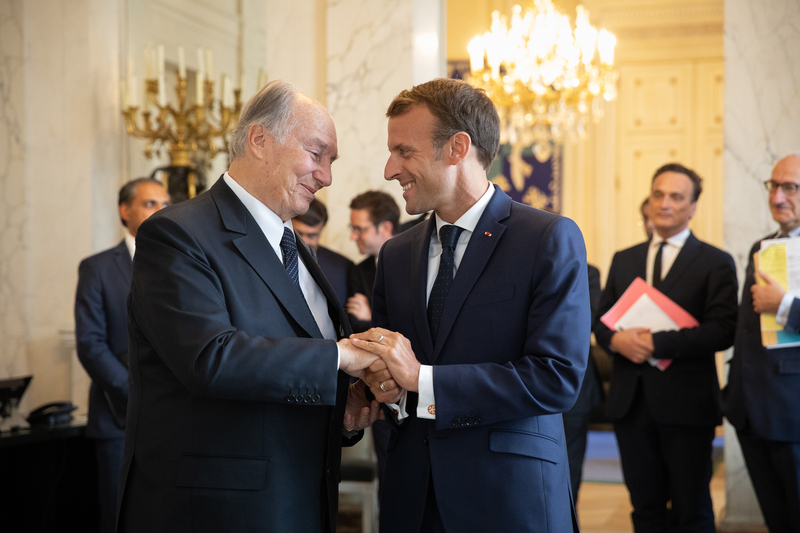 President Emmanuel Macron and Mawlana Hazar Imam after their meeting at the Élysée Palace. You have embassies in many countries, but not in Paris. No, but we have an agreement with the French government and our institutions operate in France under this agreement, which commits the Imamat. You are also very committed in and for Chantilly. Why? It's a tradition with us. In the past, many eminent figures in the history of the Imamat contributed to the quality of life in their place of residence... it's a tradition that I've applied here. You are also known around the world for horses. You own 700 thoroughbreds? I don't know what the actual number is right now, because it obviously varies depending on the time of year, but in fact it's a business that I inherited. It was my grandfather who started it, first in England and then in France. My father took it over, and upon his death, the family wondered if we wanted to continue this business or not. And we decided that yes, we wanted to try to continue this tradition. It is very common in the Muslim world. It a very enthralling sport. Your jockeys wear green silks and red shoulder pads, why is that? It's the family's colours. My grandfather used brown and green in England and red and green in France and I kept both. Your father and grandfather hit the newspaper headlines more often than you do. You opt for a more discreet approach. I believe that as a Muslim institution in the West, I can be more effective without constantly making headlines. There is no reason for me to be in the news. When there are problems I try to solve them discreetly. I don’t always manage, but in general, discretion has served me well. You are a Grand Croix of the Legion of Honour. What does this distinction mean to you? It is a recognition which is very dear to me. France welcomed my grandfather, my father, my brother, myself, my uncle. It is a country that is very dear to us.